Chinese President Xi Jinping made a five-point proposal on openness, development, inclusiveness, innovation and a rules-based approach for the Asia-Pacific and the world economy at the Asia-Pacific Economic Cooperation (APEC) Economic Leaders’ Meeting of 2018 in Port Moresby, capital of Papua New Guinea (PNG) on Nov. 18. Openness and inclusiveness are deeply rooted in the traditional Chinese fine culture, emphasizing tolerance, equal dialogue and no exclusion, said Wang Yiwei, a professor from the School of International Studies at Renmin University of China. There are still many economies in the Asia-Pacific region that are underdeveloped. As such, facilitating inclusive development and better benefitting the general public are manifestations of the development-centered and people-centered concept, Wang continued, saying that innovation should be inclusive and better benefit the general public, rather than making the poor poorer and the rich richer. Emphasis on the rules-based approach is to make the rules more compatible, meeting the demands of countries and becoming the greatest common denominator in line with the interests of all countries. The core content of Xi’s speech at the meeting was a call to expand opening up, maintain the multilateral trading system, and promote trade and investment liberalization and facilitation, said Xu Liping, a research fellow from the National Institute of International Strategy at the Chinese Academy of Social Sciences (CASS). Against a background of trade protectionism and unilateralism in the world, China has had its own voice, further stressing its determination to expand openness to maintain the multilateral trading system and demonstrating its commitment to keeping its promise and continuing to work hard in this direction, Xu said. As an important member of the Asia-Pacific family, China is an active advocate and firm practitioner of Asia-Pacific cooperation. China’s development is inseparable from close cooperation with all parties in the Asia-Pacific region; China’s development expands the channels for Asia-Pacific development. Xu said that from the very beginning of its participation in APEC, China has spared no efforts in promoting cooperation in the Asia-Pacific region. 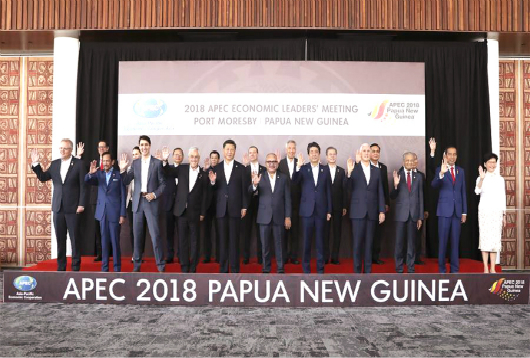 The establishment of Asia-Pacific partnerships and the promotion of the construction of the Free Trade Area of the Asia Pacific (FTAAP) have been increasingly agreed upon by the majority of APEC members. As the world’s second largest economy and the largest trader of goods, China has a huge economy. In 2017, the country accounted for about one-third of global economic growth and contributed as high as 70 percent of economic growth in East Asia. Ying Pinguang, a lecturer from Shanghai University of International Business and Economics, said that China’s economic growth is vital for global economic growth, particularly that of the Asia-Pacific region. China has also played a very important role in promoting the construction of the FTAAP, the China-Japan-South Korea Free Trade Area, the China-ASEAN Free Trade Area and the Regional Comprehensive Economic Partnership. Wang noted that China is an important driving force for economic cooperation and a leader in the concepts of development in the Asia-Pacific region. China has helped implement the First Agreement on Trade Negotiations Among Developing Member Countries of the Economic and Social Commission for Asia and the Pacific, and it has made the various Asia-Pacific cooperation mechanisms more inclusive. In addition, China has put forward a series of new ideas for development within Asia-Pacific cooperation, including the Belt and Road initiative (B&R), e-commerce, the digital economy and interconnection, committed to better benefiting the Asia-Pacific region. While realizing its own development, China has always been committed to promoting the building of a community of shared future for mankind. In recent years, the B&R has expanded channels for world economic growth. The recently concluded China International Import Expo highlighted the country’s determination to support trade liberalization and further open up its markets to the world. Over the past 40 years of reform and opening up, China’s economy has developed in leaps and bounds. The world has also benefited a lot from China’s development, said Shi Yuanhua, a professor at Fudan University’s Institute of International Studies, who added that China has become an important engine for world economic growth. China actively integrates into the international community and hopes to develop together with other countries of the world.